OXFORD, Miss. – The Oxford Day of Art was held last month at the Powerhouse. Many community artists were honored at the ceremony, and the University of Music department particularly came away with several wins. Pictured (left to right): graduate student, Melanie Culhane; associate professor, Nancy Maria Balach; and music student, Ava Street. Upon learning about the ending of Volunteer Mississippi and Mississippi Day of Giving programming, Wayne Andrews, the director of the Yoknapatawpha Arts Council and the Powerhouse Community Arts Center, along with other community members came up with the Day for Art. They hoped to create a project that would benefit and bring awareness to the local arts community. There was a voting component for the Day of Art Awards Ceremony to recognize defining artists of the community, and this year over 890 votes were cast. 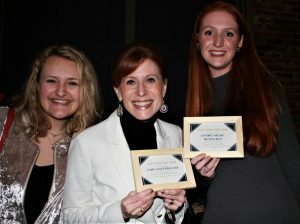 Of the eight awards categories, Ole Miss music department members, organizations, or alumni won four of them. Living Music Resource won in two categories. They won the Contributions in Visual & New Media category for their innovative live web broadcast show, LMR Live. They also won for Contributions in Staged Performances for their production of the Tony Award-winning play, Master Class. UM music alumnus, Damein Wash, won the Contributions in Music Performance category. The director of Thacker Mountain Radio, Kate Teague, received her minor in music and was involved with the UM Choir. Thacker Mountain Radio won the Contributions in Promotion of LOU as an Arts Community category.